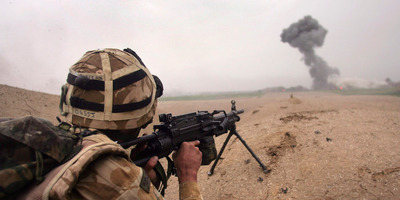 John Moore/Getty ImagesA British commando fires at the Taliban as smoke rises from an airstrike in Helmand province, Afghanistan. British Ministry of Defence announced Thursday its plans to open more combat units to women, which will allow female soldiers the opportunity to apply for special operations roles. The British military has paved the way for women to join its Special Air Services, or SAS, according to a BBC report. The SAS is one of the world’s most elite special forces branches. The British military has been phasing women into combat roles since 2016. Now, they can join the Royal Marines and infantry, which will allow them to apply for special forces units. The British SAS, one of the world’s most elite special operations communities, is now open to women, the Ministry of Defence announced Thursday. Britain has slowly been phasing women into more combat-oriented roles since 2016, according to the BBC. Now, female soldiers can join the Royal Marines and the infantry, which opens the door for them to eventually apply for special forces. “Our Armed Forces will now be determined by ability alone and not gender,” he tweeted.